What Mobility as a Service will bring to society depends on the starting points that the parties formulate. That is what Niels van Oort, researcher at TU Delft’s Smart Public Transport Lab and advisor at Goudappel Coffeng, argued at the Mobility as a Service conference at VERKEERSNET. Thinking about this is important, he says, because some assumptions conflict with each other. For example, what promotes travel convenience is not necessarily good for the environment or traffic flow. “Mobility as a Service (MaaS) is not a charm, you can not do everything with it at the same time,” says Niels van Oort. “It is important to make choices. And that means that you have to let go of some goals. “People know MaaS all kinds of goals, he sees: people from A to B bring for example or target groups for their mobility needs, but also stop congestion and keep cities liveable. 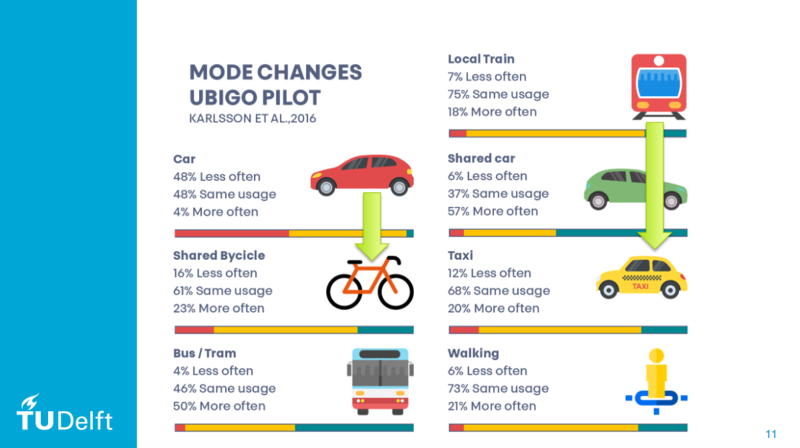 “All good,” says Van Oort, “but it is important to note that some goals may conflict with each other.” For example, promoting travel convenience is not necessarily good for the environment or traffic flow. More about that later. To measure the effects of MaaS, Van Oort and his colleagues use a framework with five e’s. It is a sort of yardstick where the consequences can be properly mapped out. The first ‘e’ refers to effective mobility. This refers to the question of how fast and reliable a journey is on a certain route. The second ‘e’ of efficient cities. This concerns the question of how we keep our cities liveable and which means of transport can best be used in which area. Economy is the third ‘e’. Economy is the third ‘e’. After all, MaaS can also deliver something through better accessibility – for society, but also for business. Van Oort also distinguishes the ‘e’ of the environment. This point has to do with the consequences for the environment and health for people. With the last ‘e’ he means equity. Maas can provide more equality, everyone who wants to travel, must be able to travel, is the idea. Van Oort is therefore very pleased with the MaaS pilots from the Ministry of Infrastructure and Water Management, the regions and various market parties. After all, they clearly show what works and what does not. However, more and more research is being published, says Van Oort. “Colleagues from Boston were looking at travel patterns in New York. 95 per cent of all journeys were potentially divisible without much extra travel time – a maximum of five minutes. “That is why it is important, says Van Oort, to know what the traveler wants. Interesting research is also coming from Scandinavia, Van Oort continues (see image below). 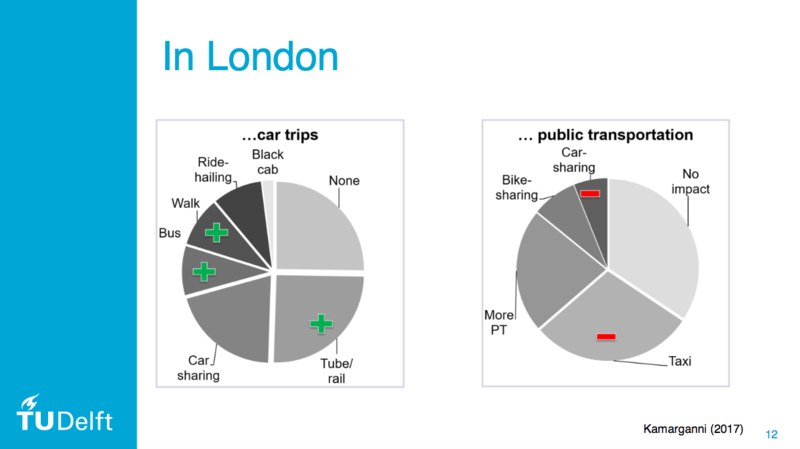 “Individual car use is declining by MaaS; people often take public transport. That is good news for the five ‘e’s’. But what if people who normally travel with public transportation suddenly take the taxi more often through MaaS? “That is, he says, much less good for the environment and the flow of traffic. According to the research, he shows that 20 percent of the respondents more often go by taxi.